It’s no secret that the cost of an education is getting out of hand. Estimates put the total amount of student debt in the U.S. at $1.5 trillion. Yikes. 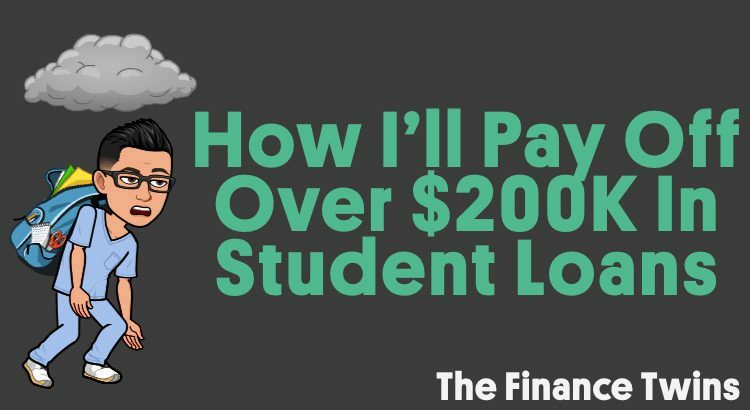 With $200,000 in student loans, I am a part of these eye-popping figures. 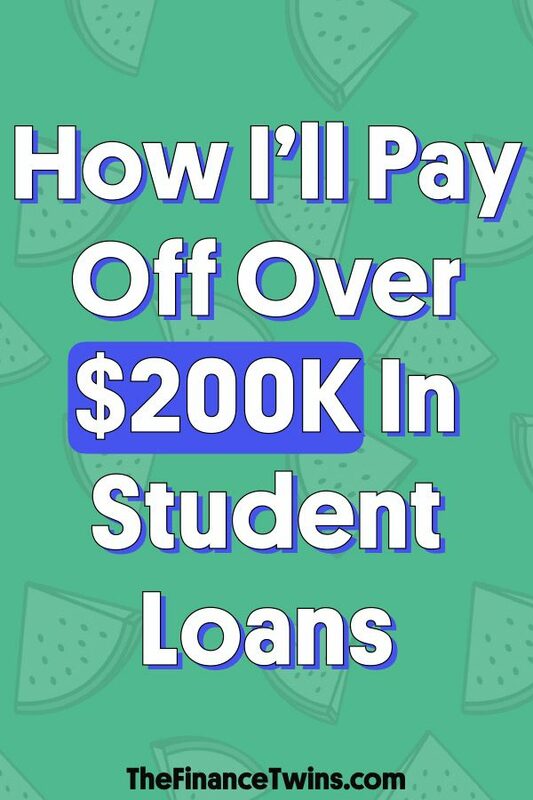 Thankfully, I have a plan to pay off my student loans. While many people carry the financial burden of an enormous amount of student debt, it’s also important to recognize how fortunate we are to live in a country where the government will loan us money to pursue and achieve our dreams. In many other countries, only those from wealthy and privileged backgrounds have the opportunity to study beyond high school. But here in the U.S., a poor kid raised by a single parent can become a doctor or go to college in the Ivy League. That’s incredible; and it may sound strange, but I am thankful for the student debt I have. But don’t get me wrong. Despite being thankful for the government’s help in pursuing my dream of being a doctor, I also don’t want to pay them back any more than I have to. It’s a double-edged sword. Lenders make borrowing so easy that many people borrow more than they should, and get into a lot of financial trouble. I plan to get rid of my debt as quickly as possible. This post will outline my plan. At the time of writing this post, I owe $198,745.68 in student loans and my wife owes about $25,000 in student loans. That brings our grand total to just about $225,000. Fortunately, we don’t have any credit card debt, a large car loan, or any medical debt to worry about. With regards to my student loans, they put me close to the median amount owed by medical school graduates around the country. This includes tuition, living expenses, residency interview costs, and visiting rotation costs (I did two separate month-long rotations away from Mayo Clinic when I thought I was going to be a urologist, but that’s a story for another day). Special shout-out to the benefactors who generously donated to the scholarships that helped me offset the $55,500 yearly tuition at Mayo Clinic School of Medicine. If it weren’t for them, my student loans could have easily been $300K+, as the yearly cost of attendance with tuition and living expenses is $86,768. My medical school class was the last class at Mayo Clinic School of Medicine to not offer need-based financial aid (all of the other top med schools offer need-based financial aid). Every student in my class received the same scholarship, regardless of their ability to pay. That means that I got the same scholarship as my peers from affluent backgrounds whose parents could pay their tuition and living expenses, and therefore graduated with ZERO debt. I do not say this to complain, but to give context as to how I have so much debt from a school that advertises the lowest average student debt in the nation. The reality is that just a handful of the students in my class carried the majority of the debt burden. The students in the classes after mine, from similar backgrounds as me, are fortunate to have much less debt than I have. This is probably more true now than ever, since Mayo Clinic School of Medicine recently received a $200 million donation from Mr. Jay Alix. The medical school was renamed to Mayo Clinic Alix School of Medicine (bonus points if you’re able to find me in one of the photos in one of the site’s pages). I graduated from Mayo Clinic in May 2018 and began my residency in June 2018. In July 2019, I begin my training in radiology at Northwestern University’s hospital in downtown Chicago after I finish my 1 year medical internship (first year of general medical training after med school). The internship is a prerequisite for my radiology residency. I will spend a minimum of 4 years in Chicago training to be a radiologist. During residency, all residents at the hospital get paid the same the amount regardless of specialty and the salaries are based on your year of training. Salaries are funded through Medicare and are published online. To see resident salaries for the residents at Northwestern click here. I’ll save you the trouble…since I will be a second year resident I will make $62,124 (before taxes). My paycheck every two weeks will come out to roughly $1,740. If I contribute to the 403B (like a 401K except for not-for-profit organizations), my take-home will be even lower. That salary will need to cover our living expenses (rent, food, utilities), insurance (renters, disability, life), daycare, retirement (401K match), other expenses (clothes, gifts, any travel, etc.) and last but not least, student loans. As you can see in the image below, I would need to pay $2,156 each month under the standard repayment plan (120 monthly payments). With the cost of childcare in Chicago ranging from $1,600-$2,200 per month and rent in that same range, you can imagine that it is impossible to cover all of the expenses on resident’s salary when over 40% of your income goes to cover student loan payments. Enter the Income Driven Repayment (IDR) plans. These are plans available for those with federal student loans that use one’s income to calculate payments. Since I will be an employee at a non-profit hospital, it makes financial sense to work towards PSLF. PSLF is a program that the federal government offers to incentivize people to work in public service jobs. In return for 10 years of service, they will forgive your remaining student loan balance. In order to qualify for Public Service Loan Forgiveness (PSLF), you must make 120 monthly payments (12 payments for 10 years) under one of the four IDR plans. Thus far, I have chosen to repay my student loans during residency with REPAYE. With REPAYE, the monthly loan payment is set at 10% of your discretionary income. Discretionary income depends on your income and household size. The more you make, the more you pay (higher discretionary income) and the larger your family, the less you pay (lower discretionary income). There are many online calculators including this one from studentloans.gov that will use your actual loan balance to calculate payments under all the different payment plans. Just log in with the same info you use to fill out FAFSA and it will calculate your payments on your actual loan balance. I use this calculator at least once or twice a year to ensure that I am on the plan that makes the most sense for me. Under REPAYE, my monthly payment is not enough to even cover the monthly interest on my loans. That means, that despite making monthly payments, my loan balance will continue to go up. One of the perks of REPAYE is that, if your payment does not cover all of the interest, they will pay 50% of the unpaid interest each month on unsubsidized student loans. So if your loans accrue $900 dollars a month in interest (like mine do) and your monthly payment is $400 dollars, the government will pay 50% of the difference as follows: $900-$400=$500; $500 x 50% = $250. That means that each month your student loans will only accrue $250 of unpaid interest instead of $500. Don’t forget to use the repayment calculator after every change in household size or promotion at work. Just because REPAYE is the best plan for me this year, doesn’t mean that it will be the best plan for me next year. You may be surprised by the difference a change could make to your payment. If you have a high earning spouse, it is probably worth looking into filing taxes as “Married Filing Separately” and using PAYE, since REPAYE will take your spouse’s income into account regardless of whether you file jointly or separately. Even with the reduced monthly payments for my student loans, it would be nearly impossible to cover all living expenses outlined above in a higher cost of living city. Though Chicago is not wildly expensive like San Francisco or NYC, it’s not exactly like my hometown in Minnesota either. Fortunately, I have another resource to help: my wife. She will also work help make ends meet. She also has about $25,000 in student debt we will be paying off. Our goal for the next four years of residency will be to avoid taking out ANY more debt. This means renting an apartment instead of buying, not financing anything we can’t afford (cars, vacations, phones, etc. ), and most importantly living within our means. The single most important factor that will allow us to be successful in minimizing our debt during my training will be sticking to our budget. We’ve been budgeting regularly for a while now, and it allowed me to borrow less money for medical school. At the end of each month, we sit down together and make our budget for the following month using our Excel budget template (those new to budgeting may prefer to do it on paper the first couple times so you can take additional notes that are easy to track). Having a partner that is NOT the same page financially is quite frankly, the quickest way to derail any financial plan. For those of you that aren’t married, don’t put off discussing money until you are engaged. You don’t want any surprises about your partner’s debt or spending habits and vice versa. Once you get married there is no more ‘my debt’ and ‘your debt’. It’s both of your debt. If you are married and you have a spouse that doesn’t agree with your perspective, don’t give up after the first try. It could take months and many attempts to get your partner to agree to have a meeting to discuss your monthly budget. They may not understand that a budget can actually greatly enhance your life. Getting through training while trying to keep our overall debt burden as low as possible is just the first step. By the time I finish my training I will be closer to 40 than I will be to 30 years old, will owe over $225,000, and will be light-years behind my non-medical peers in terms of home ownership and retirement savings. What will allow me to catch-up and surpass my peers will be my earning potential combined with a disciplined budget and an equally motivated spouse. Regardless of whether I pursue PSLF or not, I should be able to pay off my student loans within 5 years. If I choose to not pursue PSLF (if I don’t accept a full-time job at a non-profit medical practice), I will refinance my student loans to a lower rate. I will only do this if I am 100% sure I do not want to pursue PSLF, as you are no longer eligible if you refinance through a private lender. Quickly paying off our student loans will only be possible by sticking to a rock solid budget, avoiding lifestyle creep (the silent money thief), and focusing on mindful spending. Growing up poor doesn’t afford one many advantages in life, but it certainly gives you one advantage: you don’t miss what you’ve never had. I’ve never had a luxury vehicle or a large home. My wife hasn’t either. This will allow us to live a comfortable and simple life, free from large car payments, 5-star resorts, and eye-gouging mortgage payments. We know that none of these things will provide us with sustained happiness and will derail our plans. Sticking to our plan is what will allow us to beef up our retirement savings and make up for all of the lost time during medical school, residency, and fellowship. Remember, when it comes to investing and compound interest the most important factor is time. Once we are completely debt free and have made significant ground in our retirement savings, we will continue to be aggressive savers and investors. This means putting away at least 20% of our gross income into tax-deferred accounts, taxable accounts, and other investments. The other 80% will go towards, living expenses, traveling, hobbies, charity, and of course, taxes. These post-residency years will likely be our peak earning years and we expect to be in a high tax bracket. As a rehabbed impulse shopper, having a tight budget is what keeps me in line. With a rock-solid plan, I wake up each day with my eye on the prize. I also sleep better at night knowing that if something were to happen to me unexpectedly my family will be taken care of. Not only would my family get my assets, but I have term life insurance to ensure my family won’t suffer financially if I were to die before we reach financial independence. Losing your dad when you are seven years old will teach you these things. This is a glimpse into how we are attacking our combined debt as quickly as possible. And my plan for how to pay off student loans. Whether you have more or less debt, these principles can be applied broadly. It’s important to remember that you only live once and you should enjoy your life. Life doesn’t begin in the future. Life won’t start once your debt is paid off or when you get that one thing you’ve always wanted. It’s all about the journey you take along the way. Despite living with a tight budget with an eye on our life in the future, I enjoy my life every single day. Other than wishing I was able to travel more, especially to visit family domestically and abroad in Colombia or friends living abroad, I don’t feel like I am missing out on anything. While I don’t have everything I want, I have everything I need. And in life, that’s more than many people around the world. If they wake up everyday with a smile on their face, there’s no reason we can’t do the same. What’s Your Plan To Pay Off Your Student Loans? I too do not celebrate my student loans but my twin brother and I are thankful that with it, we were able to go to college because our mom would have been unable to pay for school for us. Thank you for sharing and being honest about your debt. I do not have this much debt however, I just started grad school and this information will help me, and has given me ideas as to how to work off / be paying into my school loans, and be smart about what I borrow and being wise with my money. Thank you guys for what you do and the information you share, it helps a lot. So glad that it was helpful! Good luck in grad school! Very cool that you also worked at Northwestern! Wow, I can’t imagine having that level of debt. The debt that I do have (32k in student loans) is stressful enough. But I love reading through a well evaluated financial plan. My minimum student loan payments are around $273/mo, and so I never quite understood the PAYE or REPAYE options. Thanks for the perspective, and good luck in residency! “Regardless of whether I pursue PSLF or not, I should be able to pay off my student loans within 5 years.” Do it in 3 years! 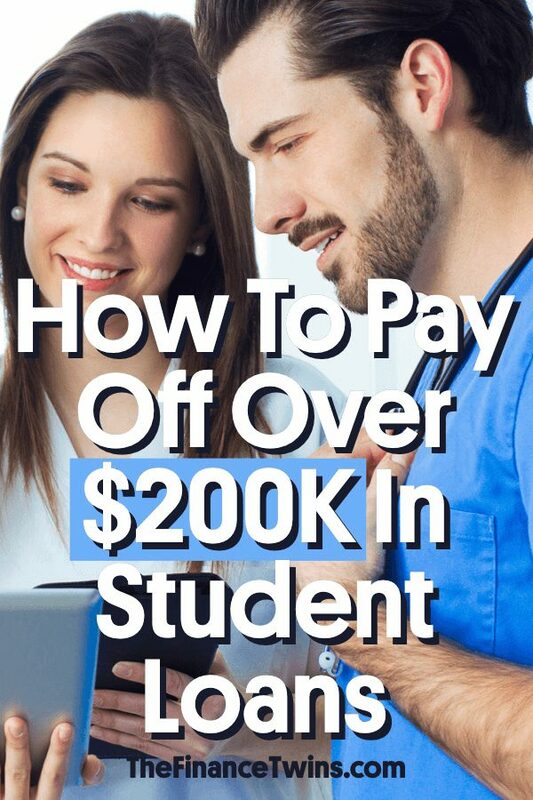 😉 I just payed off my $207,000 in law school debt in 3 years making a similar salary as you will be making when you finished residency (I think). If I could do it in 3, so can you! Love that!! Congrats to you! Yes, I think I should be able to do that. 5 years is the ‘worst-case’. You can do it! If you want to read about someone else’s journey in paying off that level of student loans debt, feel free to read the post I just published on my blog. Retireby36.com. Reach out if you ever want to discuss strategy.